I have two upcoming projects for family members that need to be made from neutrals, per their requests. Need advice how to proceed. My favorite style is usually country colors, deep tones and lots of contrast, like dark colors with light backgrounds. I'm thinking lighter neutrals with less contrast, so a "quieter"look for them. But I'm confused because I don't want it too "bland". Can you help point out some things to keep in mind as I select the neutrals I need to use? Thanks for your ideas! A while back someone posted the most beautiful log cabin, all made with various shades of cream and white and light taupes. There was nothing bland about it. "Can you help point out some things to keep in mind as I select the neutrals I need to use?" There is a book out called Modern Neutrals, and another called Spotlight on Neutrals. Both have beautiful quilts. Pick out fabrics from the palates in their quilts, and you can't go wrong. Just remember that you are making it for THEM. Your taste may not be their taste, that's why we are all different. You might really like the quilts once you get into making them. Or at least have a better appreciation for bland! lol Good luck! Neutrals come in all shades - light, medium and dark. Could it be when they say "neutral", they mean not too bold or not too bright? Are they asking for a single color tone-on-tone type of quilt? or do they want some color in it, just not an "in-your-face" color? You could do several different shades of beige, from nearly white to nearly brown, and it would look amazing. As long as you have a good selection of light-medium-dark. A problem quilters often have (including me! )is picking one shade of a color, and one shade = boring quilt! I have made a few 'neutrals' quilts- nothing bland about them- the first one was a 'Saturday sampler' program at an lqs- we made star blocks with all whites, creams, tans...one of my all time favorite quilts (and I tend to make very colorful quilts most of the time) I loved that one so much that I made the star blocks again in the same colors, added an appliqued sandhill crane to the center and made my sister in law a quilt for her Florida house- she loves it, here's a picture- nothing bland...and I made one with a crazy quilt center king sized quilt- it does have some browns added but again...it is not boring or bland in any way...and the pineapple border on the 'Amazing Grace' quilt I made are all neutrals- they are about the prettiest blocks I have ever made...one day I should make a whole quilt out of those. You can take any pattern and use nothing but neutrals. I've seen baby quilts in neutrals. I saw a GFG in neutrals. 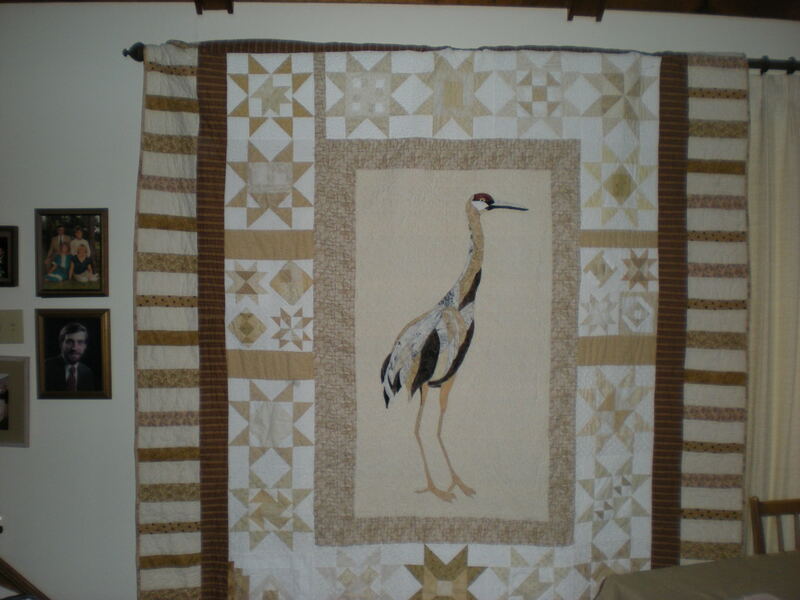 ckcowl's posted quilt is an example. Wow - Nothing bland about that quilt! When someone says 'neutrals' - I would ask for some paint chip cards of what they want so that their idea of neutrals and my idea of neutrals match. Wow CKCowl, that quilt is eye popping beautiful. An excellent example of how neutrals can be anything but bland. After sorting and organizing the bulk of my stash recently, I decided to do a neutral quilt. I did a yahoo image search, also one on pinterest, and found many. They can be incredibly stunning although subtle. What an ah ha moment, bearisgray! Letting them pick out paint chips for the colors. Best suggestion ever!!! Pay extra attention to contrast when using neutrals. I agree with Cindi; it might be helpful to find out exactly what they mean by neutrals. 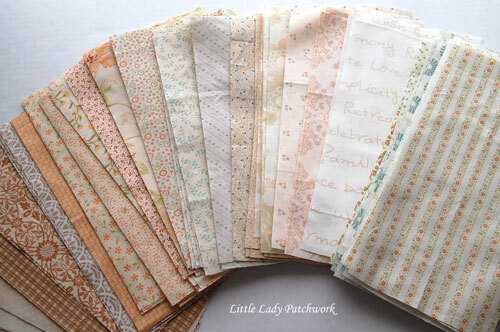 For instance, I consider this quilt to be a pretty neutral quilt, but it does have some color. Alex Anderson wrote a book about using neutrals, and one of the things she said that I will never forget is if you use colors such as cream, beige, tan, taupe, etc., make sure you throw in white. Adding white to the mix will make the quilt sparkle. She had before and after pictures in the book that really proved her point. My friend was ask to make an earth tone quilt by a friend of hers for her daughter's wedding gift. My friend thought of dark greens, rust, golds, etc. Come to find out the bride likes tones of brown. My friend doesn't like browns but she began collecting fabrics. She is doing a snowball block and had a chocolate mousse color for the center. It just didn't look right, the practice blocks she did were just too dull. So she switched out the mousse color center for a lighter color, more like cream. That made the other browns stand out and was the perfect color. So I would say use some white or off-white fabric to make the browns perk up. Post a picture when you are done! Hey, All! Thanks so much for the great replies! You've given me lots to think about and wonderful pix of examples of anything BUT bland! (didn't mean to offend anyone, just didn't know how else to say it!) when I look at my stash of "neutrals", it looks like I have all the same value, so I may need to shop for some darker values. You've all helped a lot! Thanks! I've made a couple of cot quilts in soft colours like the starblocks of ckcowl's quilt above. Crazy patch blocks were alternated with a white block with an appliqued bunny or the like on it. Both were loved by the new mums i'm pleased to say. Wow ckcowl your quilt is stunning. I also have a FL home with Sandhills cranes right in the yard. Your appliqué is lifelike and stunning. My friend was ask to make an earth tone quilt by a friend of hers for her daughter's wedding gift. 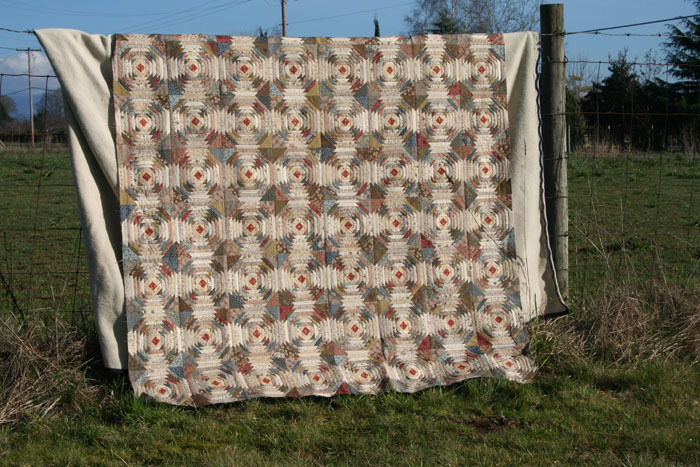 You might look at and have them look at this site to see all kinds of taupey-beigey quilts. And here are some examples of neutral colors. But the paint chip idea is the EASIEST ever for the quilter! I did it for a quilt my DGS wanted and was able to match the swatches perfectly. I agree. That is a grear idea! Your quilt is beautiful and inspiring! I love the use of colors and also the design. You did a wonderful job on it! I like the idea of paint chips. Neutral can mean any color. Just by the posts, we all have different ideas as to what neutral is. I have a lime green and black quilt on my sofa, neutral to me. The fabrics I used blend so well together that the lime green is not shocking. Earth colors depend on what part of the earth you are on. Live in the mountains and greens would work. Yet live on the beach and sand and water colors may be your colors. Before making a quilt, finding out what actual color group the new quilt owner wants might keep a quilt out to display and not put in the closet never to be seen again. When I was looking to do a quilt for my daughters bedroom we used the paint chips from Lowes. I had painted the walls about 6 months prior and wanted to match the quilt to it- light green and teal. It helped so much!! Take a look at the White Chocolate pattern from Stitchin Heaven. Pictures don't do it justice! I am going to make this one next!